Santorini, situated in the southern Cyclades islands in the Aegean sea, is one of the most magical places we have been in a while. Devastated by numerous volcanic explosions (whole towns destroyed), it is none the less one of the biggest spectacles of the med. It is incredibly beautiful and dramatic, in a kind of structured and arid way, with delicious whitewashed, cubiform houses on top the clifftops overlooking the sea and past volcanic rock forms. It is the perfect picture postcard-cliché. Even though the island felt quite stripped of nature (very few trees), it benefits from the rich soil, holding water and nutrients well from the volcanic ash content, good for the vines, creating the most delectable infamous tomatoes and wine. We were also pleasantly surprised by the local-daily caught fish, with all the depressing tales of our overly fished oceans, the sea seemed to be quite abundant in fish. Everyday lunch consisted of a typical Santorini feast- Greek salads, tzatziki, fried aubergine and courgette, squid and a barbequed fish. But one of the most delightful of all was the charred octopus. Found hanging on washing lines on arrival to the tavernas- a method of sun drying them before hitting the flames. Fantastic, simple and just what you fancy.. washed down with a cold glass of Santorini white wine. Within the first week of returning we order an octopus from The Fish Society, both complete novices, we await its arrival and start conjuring up ideas of how we are going to prepare and serve it. When the big day comes- we find ourselves starring into Jemima’s kitchen sink as the cold water pours over its jelly-like body, with its slimy and long scary tentacles making us quiver. Worst of all we can see its beady intense eye staring at us. A lot of squeals later of ‘no you pick it up’ ‘no you’. We are on our way to simmering and tenderising our alien-like monster. Once you see it in the pot with the onions, garlic and bay it starts to normalise the whole procedure, and soon we find ourselves easily slicing the tentacles from its head, marinating and slapping it onto a very snazzy pipping hot big green egg. Charred is definitely our favourite way to eat it, with the smoky taste and crisped texture, it keeps its tender delectable centre. We love this style of plating up, having something soft spread beneath with a play of textures and colours on top. This really is a wonderful dish and worth all the squeals beforehand. 1. Place the octopus in a large pan with the onion, garlic, chili, peppercorns, lemon and white wine. Cover with water and bring to the boil. Simmer for about 1 hour, till tender when pierced with a knife. Drain and leave to cool. 2. Make the butterbean puree. Heat the butter in a pan over a medium heat and add the garlic, leek and sage, cook for 5 – 8 minutes until soft. Add the butterbeans and coat in leek mixture then add the white wine, salt and pepper. Reduce and break up the beans with a wooden spoon. Take off the heat. Once it is cool blend till smooth in the food processor. 3. Make the salsa. Mix all the ingredients together. 4. Light the BBQ and let the coals get very hot. 5. Pull the tentacles away from the head, discard the head. Slide your hand down the tentacle to take off any skin. 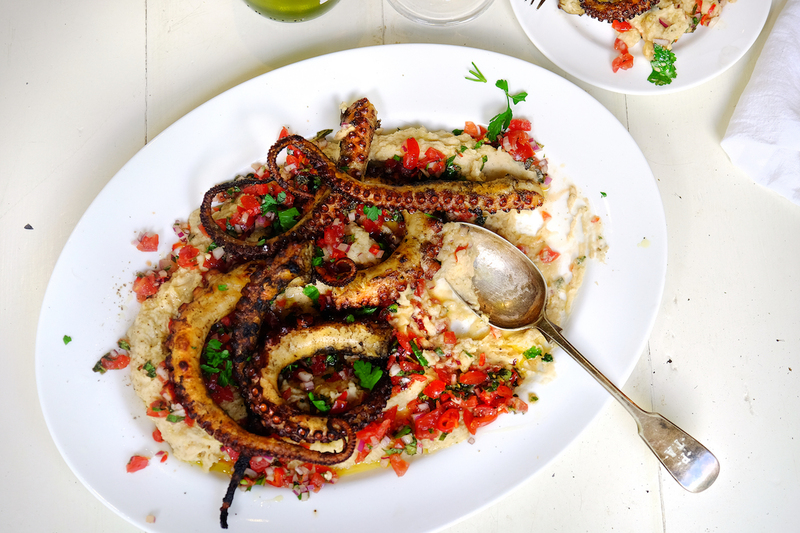 Place the tentacles in a bowl, drizzle with olive and season with salt and pepper. Place on the BBQ and char for about 10 minutes till nice and crisp. 6. Spoon the puree over the platter, then sprinkle over the salsa. Place the octopus on the top with chopped parsley and a good squeeze of lemon.